Well, in a sudden and unforeseen turn of events, I find myself starting on ANOTHER Chevy build. How unusual! This one however, has a difference. One of my local hobby shops has teamed up with a local model paint manufacturer to run a competition with all proceeds going to the charity that supports our local Children's Hospital. The Royal Children's Hospital Good Friday Appeal has been running since 1931, and in that time has raised over $345 Million through the goodwill of the people, and all goes into helping run the hospital. Individuals, businesses, clubs, schools, even entire country towns run events and parties and other fundraising activites every year for this appeal. In our little contribution here, the LHS has made available 45 identical kits, the paint manufacturer 45 bottles of paint (colour of your choice), each builder pays basically retail price the proceeds of which go to the appeal. We all have until April 13 to complete and return our builds to the LHS where there will be a anonymous display and judging in OOB and Modified categories, and the winner in each category can select from a range of prizes up to over $300 in value. This means I have about 10 weeks to get this completed and returned to the store. I will attend the display and try to photograph each completed build as well. I will be building my kit OOB, but since the display for judging needs to be anonymous (no owners names on any kits) I won't be able to show my selected colour scheme until after the event. I will show as much progress as I can and then fill in the blanks later. This should be fun as I know some of the other modelers and there are some exceptional builders amongst them. A lot of car specialists and custom modifiers and paint gurus who leave me speechless with their results. I'm in this because it's a great cause and a chance to catch up with old acquaintances and make some new ones. The body looks very neat, minimal cleanup to do on some flash and parting lines. Off now to Google some schemes and engine details. Very interesting. Great cause. But even for a Chevy, that's an ugly car. Usually not a fan of fender skirts, but this one looks far better wiht the FS. Would be cool with a two tone paint job. D., that car is ugly enough to be to my liking. You have a follower here. And, yes, I'd like to see a healthy OOB build Nice build for a noble cause! Interesting car, and a great cause. Good luck in the contest, and I look forward to updates when you can do them. The legendary "Blue Flame Straight 6"
Torsten, great to see you here mate! Thanks for checking in. As I suspected, we share a common ailment. We are all Styrenoholics. No point denying it, embrace it and enjoy it. More work tonight on cleaning up parts and putting together a few sub assemblies. This kit is unlike any I have encountered before in that the underside floor pan is actually part of the interior "tub". This will actually make things a bit easier as I am planning to paint the chassis rails semi-gloss black, but the floor pan to match the body colour. A happy accident! The things that we do that nobody will ever see or even be aware of, but we just cannot compromise. This part is the clutch and brake pedals which glue to the interior tub and will be tucked away under the dashboard never to be seen again. On the left is the kit part as supplied, out of alignment with a large mould line across the middle. On the right is how it looks after a bit of trimming and tidy up. All part of the fun! You can barely even see it in the previous image attached to the interior tub, but it's styrene, and it just has to be right! This happens to you, too? I thought it was just me! Maybe it's a "Model Company Conspiracy" to get us to build the kit so we'll buy more. What an honor to have you stop by the AutoModeler Forum. Pulling up my rocking chair and following right along. You're too kind, my friend! Thanks! But I'm also interested in cars and visit museums every time I see one on my way, even if it's accidently like the Härnösand Bilmuseum, Sweden's biggest car museum during my holidays up there last summer. Dream cars you guys would fall on your knees! Usually I need 4-6 hours for a museum visit, here I had only 2 1/2 hours before closing time but I've seen the most of it. Another one, which was on my "have to do" list last summer was the Saab Car Museum in Trollhättan, the old manufacture town of that car. No where else in Sweden you see more Saab cars in the streets than here. So you see, I'm pretty much into cars, maybe more than you think. Oh, btw, my own car is a faithfull 13 years old Ford Focus, which has taken me to so many places in Europe so far. I never knew about your interest in cars. 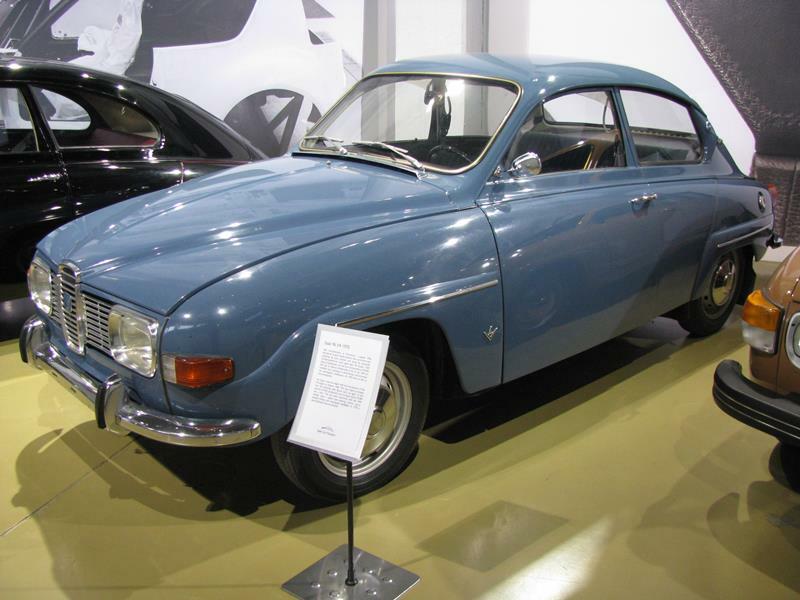 And speaking of Saabs, when I was in college, my 1st two years I got my father's Saab 96. Great little car, and great in the snow, but everyone knew when I was coming with that 3 cylinder, 2 cycle engine singing it's song. Your ford Focus is the same age as my wife's Hyundai Sonata GTS. But it only has 36,500 original miles on it. Torsten, perhaps we can tempt you to build something automotive? It would be great to have you join the ranks here mate! If you count trucks also to automotive, I'm already doing that. My next build will be the truck I drove during my army time in the 1980's. I take part in that Logistic Campaign on Amorama. At the moment I have some dual Saab stuff on my bench but with 3 wheels. The single seater is already finished and photographed, the twin seater will still need a few days after a big paint accident. So you guys might have a look in my jet collection thread soon. Joel, my Ford Focus has now nearly 150.000 km on the clock (94.000 mls). That's nothing for a Diesel but I don't need to drive to work with it. So it's only going long distances. Outside of the Saab 96 not being Red, it sure does bring back some found memories. Thanks for sharing, it's much appreciated. I've been tinkering with the interior on this build and came up with a colour combination I like for the seats and door trim. These will get a gloss coat and a thin wash of a mid-brown. More soon! Thanks Jim, I'm very happy with it as well. I have gloss coated the interior parts, while that cures ready for a wash I have done some work on the underside. Chassis rails and tank sprayed Tamiya X-18 Semi-Gloss Black, than the rails were masked and the tank sprayed with Alclad Airframe Aluminium. Next step is to mask the tank and spray the pan with the body colour. Nice, I'm really beginning to love the Alclad Aluminum. It went onto my F-94 so nicely I'm planning on using it for my A-20C. Have you ever tried their chrome for auto parts? Love the look of the interior. Thanks Jesper, your feedback is much appreciated. After a bit of experimenting today I found I could airbrush my Citadel paint, why did nobody tell me this already? Thinned with about 60% Tamiya X-20A, it went on really nicely! The casting texture on the engine block is a bit heavy, but you can see the smooth paint on the sump and rocker cover. I am impressed. The engine still needs a pin wash of oily grimy goodness. The interior got a coat of Tamiya X-22 Clear Gloss and once that was cured I gave it a wash with Burnt Umber oil paint. I also put the last couple of parts on the engine.